The video can be viewed publicly online via Avon Philippines’ website www.avon.ph, YouTube and Facebook pages, as well as KGBC 2017 Facebook page. Complementing the online video campaign are the Pink Minute bud ads and LED screen placements along EDSA and C5. “The Breast Cancer Promise strengthens our commitment to helping save women’s lives,” said Agnieszka Isa, Executive Director for Marketing. “We believe that no woman should succumb to the disease because she didn’t know about it or didn’t have access to information about it.”During the launch, Avon also presented the facts that came out of the recent Avon’s global survey, which involved 19,000 women respondents. The survey revealed that 73% look out for changes in their breasts, although they are not confident as to what signs lead to breast cancer. The respondents revealed their lack of knowledge about breast cancer, with 30% saying they haven’t received any information about the illness. In fact, 25% of the respondents believe a lump is the only sign of breast cancer that can be detected without using any medical device. When asked if they would go for a medical advice for a check-up, 60% of them said they would hesitate for reasons such as embarrassment, fear, and lack of access to a doctor. 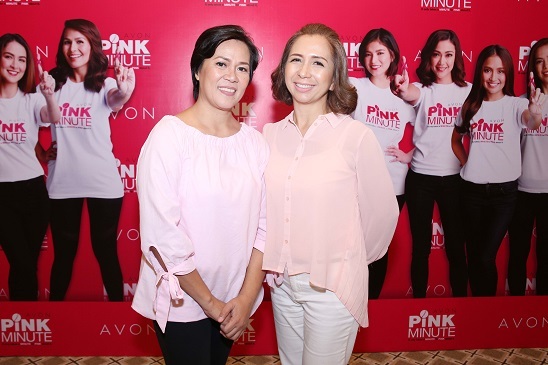 Aside from raising awareness around the importance of early detection in defeating breast cancer, Avon Philippines’ Pink Minute also aims to raise funds and provide free consultation to women in the whole month of October. Those who wish to know more about how to properly execute BSE, get free consultation, and know more about breast health may dial the Pink Minute hotlines 0917-155PINK (Globe) and 0928-524PINK (Smart). Join the fight against breast cancer and take home Avon Gift Packs, too with the Avon Kiss List Promo! 1. Do the pink minute pose and post it on your Facebook accounts. 3. Set your post to public. It’s that easy! Not only will you get to join the movement, you’ll also take home amazing goodies from Avon! 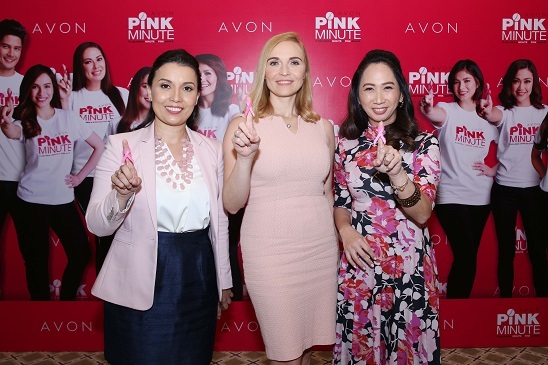 Since its launch in 2002, Avon Philippines has raised close to P24M through product sales, donations, and walk/run events in support of the advocacy program. This year, Avon’s Sweet Honesty Promise Eau de Toilette Spray and pedometer watch are the participating products for the fundraising.